So there’s this weird little twist of events that leaves me in Connecticut with my husband’s family all week this week – without him, and without a car. I’m happy to travel by sneakers as much as I can while I’m here! See, Hedman Family Christmas always happens over the weekend before Christmas, where 18 people head toward Fairfield, CT for a day, since the littlest kids all live here. And real Christmas isn’t until Thursday this week. With my parents traveling down South in their RV, there’s no one back home on Cape Cod to open presents under the tree with! So we figured we would stay in Connecticut and enjoy reading “Twas the Night Before Christmas”, opening pajamas from Santa on Christmas Eve, and waking up with the excitement of our nieces and nephew! When one of the families I’m closest to in my photography business (photographed one wedding, another one coming up, and other engagement sessions) asked, I said sure! I can photograph everyone when you’re all together in Connecticut on December 23rd! But it turned out that Gary had to work, and we couldn’t find a way around it, so he and “his” dog drove home on Sunday, and won’t be back here until Christmas Eve. I’m here with “my” dog! 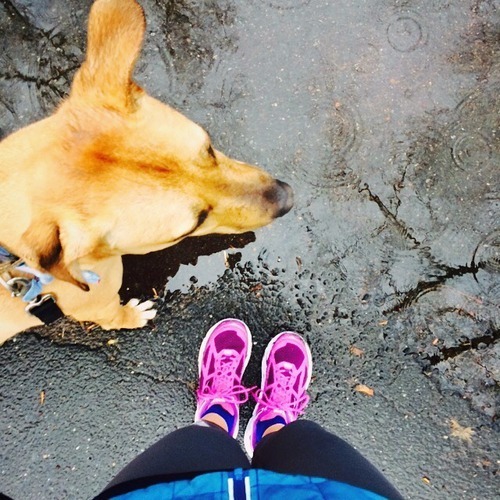 It has been gray and damp, but he ran 2 of my 7 miles with me yesterday, and 3 today! 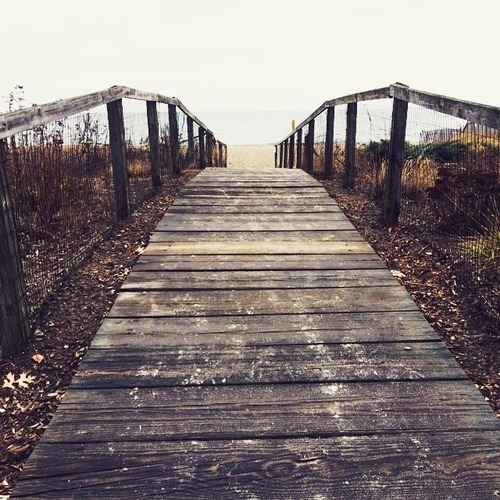 We’re right next to Fairfield University’s campus, and I knew my way down to the beaches as well, where we run the Fairfield Half Marathon every June. Wait, his dog and your dog? We’ve been married 10 years next month, so obviously our dogs are not really “his” and “hers”, but they are ;-) We take turns choosing and naming a dog, and right now Cajun is my bud! (Gary wanted a retrieving dog and brews beer, so he’s with Brewer. I wanted a straight up of-course-I-rescued mutt and well, we called him “the Cajun dog” – from Baton Rouge – for too long before we could come up with a name). Also, having our own dogs allows us to blame the other person’s dog for indiscretions around home. Anyway, back to our regularly scheduled programming! I’m enjoying extra time with my sister-in-law, photographing a couple of sessions, meeting up with a high-school pal, running (on foot) around town, and I’ve even taught our 10 year old niece to knit! That’s about the same age my grandmother taught me! But wait, I’m not old enough to be a grandma, so let’s remember: I’m the aunt. Hope you’re having a great Christmas pre-game or Hanukkah in your home this week! It’s kinda nice that our shopping stress was last week, and now we can just kick back! Are you ready? Who in your family will run with you this holiday season? What running gifts will you be looking for under the tree? Eeeee! Didn’t expect to see me?